When seconds count, you don’t want to waste them fighting with your gear. With SmartDock the preferred, hands-free SCBA holder for firefighters, there are no straps or levers to slow you down. 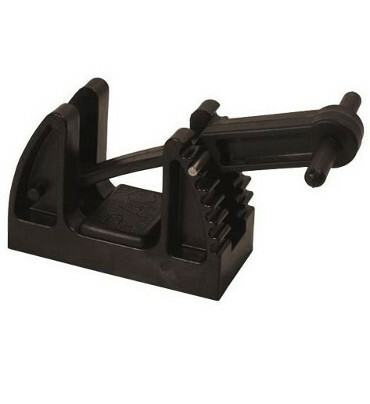 In a collision, the top claws clamp down, preventing the SCBA from becoming a projectile. Engineered to fit most SCBAs, SmartDock can also be retrofitted to a wide variety of seats. 1. How does SmartDock hold the SCBA? SmartDock is the first completely hands-free SCBA holder for fire apparatus. The system provides single-motion insertion and extraction of the SCBA, holds the cylinder securely in place while in transit, and releases using no straps or levers. In the event of a crash, the inertial locking feature prevents it from becoming a projectile.2. Why is hands-free operation important to firefighters? Hands-free release of SmartDock leaves the firefighter free to reach for tools, exit the truck and get to the job at hand. Current docking stations on the market require firefighters to operate release levers and cumbersome straps that can become entangled with seat belts and firefighting gear. The innovatively designed SmartDock is a strap-free docking station that offers single-motion SCBA insertion and hands-free release when the firefighter moves forward to exit the seat.3. How do I install an SCBA in the SmartDock? SmartDock offers the convenience of single-motion insertion. Simply insert the cylinder valve into the base of SmartDock and lock it into place by pushing the cylinder into the top latching mechanism. No straps or harnesses are needed.4. If there are no straps, what holds the SCBA in place? The heavy-duty top latching mechanism in the SmartDock housing grips the cylinder and holds it securely in place during transit. In the event of a collision, inertial forces cause the top latching mechanism to lock the SCBA in place, preventing it from becoming a projectile. 5. How is the SCBA released? Once the SCBA is strapped on, simply bend at the waist and stand up to release the tank from the upper claw. No release levers are required. The body’s natural momentum releases the tank as the firefighter stands up to exit the vehicle. 6. If the SCBA is strapped on in transit, do I still need to wear a seat belt? SmartDock is NOT an occupant restraint system. Therefore, the vehicle seat belt must be worn anytime the vehicle is moving. 7. What happens if a firefighter is sitting in a seat without an SCBA? Is SmartDock safe to sit against? Per NFPA 1901, SCBA seats should either have an SCBA in place or have a parade panel in place while the vehicle is in motion. 1. Can I fit SmartDock into my current seat? With its low profile, SmartDock can retrofit to a wide variety of SCBA seats on the market and is available in the aftermarket through various channels of distribution. 2. Does SmartDock accommodate SCBAs of different sizes/manufacturers? SmartDock adjusts to accommodate 30-minute, 45-minute and 60-minute cylinders of various makes and models of SCBA, fitting nearly all SCBAs used in U.S. fire departments. For information on SCBA compatibility, contact IMMI at 866-765-5835. 3. If my department has several SCBA models, do I need to get several models of SmartDock, or can I adjust the equipment at the station to fit my equipment? SmartDock is now offered in one model. The design is engineered to fit a wider variety of makes and models of SCBA than the original SmartDock, and with its low profile, it interfaces effectively with a wide variety of SCBA seats on the market. Instructions are provided to aid customers with installation to achieve the best fit for specific SCBAs and seats. 1. Has the SmartDock been crash tested? Yes, SmartDock has been tested at the Center for Advanced Product Evaluation (CAPE) to exceed the NFPA 1901 Standard for Automotive Fire Apparatus. When evaluated to the NFPA 1901 Standard for Automotive Fire Apparatus, SmartDock met requirements for retaining both the cylinder and the pack in dynamic testing.